The rivalry that is the New Orleans Saints and Atlanta Falcons has been one of the better ones over the past couple of years and it got that much crazier after Sunday’s game. 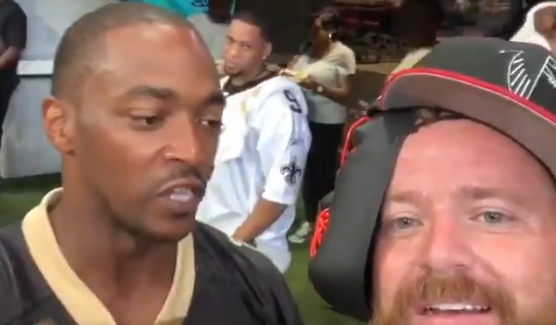 Among the thousands of screaming fans at Mercedes-Benz Stadium was Avengers actor Anthony Mackie draped in his New Orleans Saints gear to watch his favorite team. One Falcons fan just happened to notice him down on the field, so he took his phone out and proceeded to instigate a reaction out of him. Mackie attempted to ignore him, but it got too much so he had to roast the man before he walked off.